Miss A. Rhoda walked into Milwaukee ‘s Kopf Pharmacy on October 21, 1897. She ordered one bottle of Best Tonic , which cost her twenty-five cents. The Hugo S. Kopf Pharmacy, located at 78 Juneau Avenue, was one of many pharmacies that sold the Pabst Tonic. The customers were middle class women who would not enter a saloon for alcohol, but would have no fear in buying alcohol-based medicinal beverages from the pharmacist. There were no laws regulating patent medicines until 1906 so the manufacturers used whatever methods necessary to provide the product to its customers. Cards and pamphlets about the product were also distributed in the pharmacy. 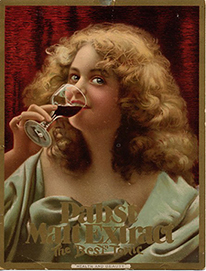 Advertising of patent medicines was possible because the manufacturers supplied the promotional material as well the campaign strategies they thought would attract customers. For example, it was not uncommon to conduct a contest to see what pharmacist would construct the best window display with the patent medicine as the focus of the display. So it was that the local pharmacy became a major outlet for Pabst Tonic.